Andrei Alexandrovich Zhdanov (Russian: Андре́й Алекса́ндрович Жда́нов; IPA: [ɐnˈdrej ɐlʲɪˈksandrəvʲɪtɕˈʐdanəf]; 26 February [O.S. 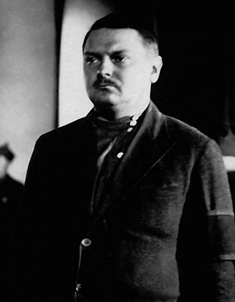 14 February] 1896 – 31 August 1948) was a Soviet politician. After World War II, he was thought to be the successor-in-waiting to Joseph Stalin, but Zhdanov died before Stalin.